Not to be confused with Finnicization. Finlandization (Finnish: suomettuminen; Swedish: finlandisering; German: Finnlandisierung) is the process by which one powerful country makes a smaller neighboring country abide by the former's foreign policy rules, while allowing it to keep its nominal independence and its own political system. The term means "to become like Finland" referring to the influence of the Soviet Union on Finland's policies during the Cold War. The term is generally considered pejorative, originating in West German political debate of the late 1960s and 1970s. As the term was used in Germany and other NATO countries, it referred to the decision of a country not to challenge a more powerful neighbour in foreign politics, while maintaining national sovereignty. It is commonly used in reference to Finland's policies in relation to the Soviet Union during the Cold War, but it can refer more generally to similar international relations, such as Denmark's attitude toward Germany between 1871 and 1945, or the policies of the Swiss government towards Nazi Germany until the end of World War II. In Germany, the term was used mainly by proponents of closer adaptation to US policies, chiefly Franz Josef Strauss, but was initially coined in scholarly debate, and made known by the German political scientists Walter Hallstein and Richard Löwenthal, reflecting feared effects of withdrawal of US troops from Germany. It came to be used in the debate of the NATO countries in response to Willy Brandt's attempts to normalise relations with East Germany, and the following widespread scepticism in Germany against NATO's Dual-Track Decision. Later, after the fall of the Soviet Union, the term has been used in Finland for the post-1968 radicalisation in the latter half of the Urho Kekkonen era. 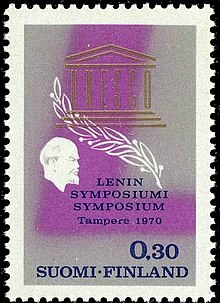 In April 1970, a Finnish stamp was issued in honor of the 100th anniversary of the birth of Vladimir Lenin and then the Lenin Symposium held in Tampere. In Finland, the term "Finlandization" was perceived as blunt criticism, stemming from an inability to understand the practicalities of how a small nation needs to deal with an adjacent superpower without losing its sovereignty. These practicalities existed especially because of the lingering effect of Russian rule in their time, before the Finns first gained sovereignty, and because of the precarious power balance eastwards, springing from a geographically extended yet sparsely populated state with a traditionally imperialist superpower right across the eastern border. The reason Finland engaged in Finlandization was primarily Realpolitik: to survive. On the other hand, the threat of the Soviet Union was used also in Finland's domestic politics in a way that possibly deepened Finlandization (playing the so-called idänkortti, "east card"). Finland cut such a deal with Joseph Stalin's government in the late 1940s, and it was largely respected by both parties—and to the gain of both parties—until the fall of the Soviet Union in 1991. While the Finnish political and intellectual elite mostly understood the term to refer more to the foreign policy problems of other countries, and meant mostly for domestic consumption in the speaker's own country, many ordinary Finns considered the term highly offensive. The Finnish political cartoonist Kari Suomalainen once explained Finlandization as the art of bowing to the East without mooning the West. Finland's foreign politics before this deal had been varied: independence from Imperial Russia with support of Imperial Germany in 1917; participation in the Russian Civil War (without official declaration of war) alongside the Triple Entente 1918–1920; a non-ratified alliance with Poland in 1922; association with the neutralist and democratic Scandinavian countries in the 1930s ended by the Winter War (1939); and finally in 1940, a rapprochement with Nazi Germany, the only power able and willing to help Finland against the expansionist Soviet Union, which led to the nation's re-entry into the Second World War in 1941. The Wehrmacht's defeat in the Battle of Stalingrad led Finland to basically revert to its 19th-century traditions, which had been perceived as highly successful until the Russification of Finland (1899–1905). Finland's leaders realised that opposing the Soviets head-on was no longer feasible. No international power was able to give the necessary support. Nazi Germany, Finland's chief supporter against Russia, was losing the war. Sweden was not big enough, and its leadership was wary of confronting Russia. The western powers were allied with the Soviet Union. Thus Finland had to face its bigger neighbour on its own, without any great power's protection. As in the 19th century, Finland chose not to challenge Soviet Russia's foreign policy, but exerted caution to keep its independence. After the Paris Peace Treaty of 1947, Finland succeeded in retaining democracy and parliamentarism, despite the heavy political pressure on Finland's foreign and internal affairs by the Soviet Union. Finland's foreign relations were guided by the doctrine formulated by Juho Kusti Paasikivi, emphasising the necessity to maintain a good and trusting relationship with the Soviet Union. Finland signed an Agreement of Friendship, Cooperation, and Mutual Assistance with the Soviet Union in April 1948, under which Finland was obliged to resist armed attacks by "Germany or its allies" against Finland, or against the Soviet Union through Finland, and, if necessary, ask for Soviet military aid to do so. At the same time, the agreement recognised Finland's desire to remain outside great power conflicts, allowing the country to adopt a policy of neutrality during the Cold War. As a consequence, Finland did not participate in the Marshall Plan and took neutral positions on Soviet overseas initiatives. By keeping very cool relations to NATO and western military powers in general, Finland could fend off Soviet pressure for affiliation to the Warsaw Pact. However, from the political scene following the post-1968 radicalisation, the Soviet adaptation spread to the editors of mass media, sparking strong forms of self-control, self-censorship and pro-Soviet attitudes. Most of the élite of media and politics shifted their attitudes to match the values that the Soviets were thought to favor and approve. Only after the ascent of Mikhail Gorbachev to Soviet leadership in 1985 did mass media in Finland gradually begin to criticise the Soviet Union more. When the Soviet Union allowed non-communist governments to take power in Eastern Europe, Gorbachev suggested they could look to Finland as an example to follow. In the years immediately after the war (1944–1946), the Soviet part of the allied control commission demanded that public libraries should remove from circulation more than 1,700 books that were deemed anti-Soviet, and bookstores were given catalogs of banned books. The Finnish Board of Film Classification likewise banned movies that it considered to be anti-Soviet. Banned movies included One, Two, Three (1961 film), directed by Billy Wilder, The Manchurian Candidate, directed by John Frankenheimer in 1962, One Day in the Life of Ivan Denisovich 1970 by Finnish director Caspar Wrede and Born American by Finnish director Renny Harlin in 1986. The censorship never took the form of purging. Possession or use of anti-Soviet books was not banned; it was the reprinting and distribution of such materials that was prohibited. Especially in the realm of radio and television self-censorship, it was sometimes hard to tell whether the motivations were even political: for example, once a system of blacklisting recordings had been introduced, individual policymakers within the Yleisradio also utilized it to censor songs they deemed inappropriate for other reasons, such as some of those featuring sexual innuendos or references to alcohol. United States foreign policy experts consistently feared that Western Europe and Japan would be Finlandized, leading to a situation in which these key allies no longer supported the United States against the Soviet Union. The theory of bandwagoning provided support for the idea that if the United States was not able to provide strong and credible support for the anti-communist positions of its allies, NATO and the U.S.–Japan alliance could collapse. However, foreign policy scholars such as Eric Nordlinger in his book Isolationism Reconfigured have argued that "a vision of Finlandization in America's absence runs up squarely against the European states' long-standing Communist antipathies and wariness of Moscow's peaceful wiles, valued national traditions and strong democratic institutions, as well as their size and wherewithal". ^ Kaplan, Robert D. (2015). Asia's Cauldron. USA: Random House Trade Paperbacks. p. 26. ISBN 978-0-8129-8480-4. ^ Ekholm, Kai (2001). "Political Censorship in Finnish Libraries in 1944–1946". Libraries & Culture. 36 (1): 51–57. doi:10.1353/lac.2001.0008. ^ "Isolationism Reconfigured: American Foreign Policy for a New Century", The Independent Review, The Independent Institute.